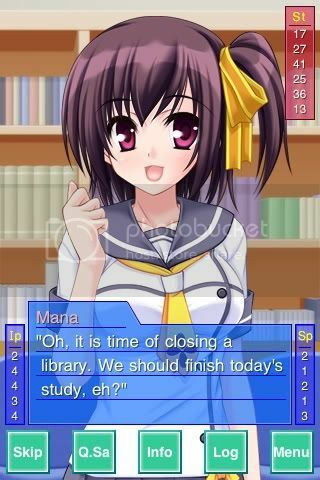 The Anime Almanac » Blog Archive » The Daily Almanac: It is Time of Closing a Library. The Daily Almanac: It is Time of Closing a Library. Jon over at JanaiBlog pointed me to this visual novel app for the Apple iPhone last night, My Neighbor Girl (iTunes link: full version and free trial version) . It’s such a simple and stupid game, but I ended up playing all night. Even though I’m still in the middle of playing the latest Ace Attorney game from Capcom, I opted to play the amateurish My Neighbor Girl instead. I think what really drew me to the iPhone app was the fact that the Japanese programmers actually tried to translate it into English themselves. Not only did they put together a grammatically incorrect and awkward sounding script, but they actually had their Japanese voice actress attempt to read it out loud! Now all things considered, the Japanese girl’s English is not all that bad. One might assume that she’s probably the top of her class when it comes to foreign language. But still, she sounds very uncomfortable as she struggles to pronounce the English words through her thick Japanese accent. And she gets no help from the script she’s reading from because, as you can see from the screen cap above, it becomes complete nonsense at moments. At first I was appalled by all the Engrish and switched over to the Japanese audio and text, but then I decided to give it a second chance. And she eventually won me over. There was something kind of cute about the way she was struggling with her English. Kinda moé, in a way. So if you have an iPhone or iPod Touch, give this one a shot. See if its poor translation wins you over as well. Okay, so here was a little bit of news that slipped through the cracks during Katsucon weekend. Japanese video game publisher NIS is entering the American anime market when they announced the upcoming release of Toradora and other series. Now everyone in this field – at least the pessimistic ones – have been asking themselves just what is NIS thinking in trying to enter the market at this point? The anime DVD market is dying, and it has been dying for years. It’s gotten to a point where there is only one big company left in the industry, and everyone else is just struggling to survive right now. Well, NIS made an appearance on ANNcast last week, and as it turns out, the current dismal state of the market is the reason why they’re entering it. They’re seeing it as a market thinning out right now, so they can step right in and get all those hot titles while the gettin’s good! I can appreciate their optimism, but man, how could they possibly succeed doing the exact same thing that is not working for other companies? Their plan is to just release sub-only DVDs, and they are not looking to expand beyond that market any time soon. They think that the niche products are just going to magically sell themselves when history has shown that they don’t anymore. The Japanese have had a really bad track record when it comes to entering the American anime market like this, and I don’t see how it’s going to be any different for NIS. But at least they seem to have a great PR department in place and they have been very open and welcoming to the fan community since the announcement. That’s actually a lot better than most veteran anime companies in the industry these days, so hopefully that gives them a fighting chance. Either way, I do look forward to checking out Toradora in the near future. Michael Pinto of Fanboy.com says that “anime isn’t about the complexity but the storytelling,” and I couldn’t agree with him more. Whenever anyone asks me to define what makes anime and manga so special, I tell them that it’s the combination of visual art, fantasy, and storytelling. I never really considered the medium all that deep or meaningful. It’s just a highly creative form of entertainment, and that’s what makes it so wonderful. Now, I know that not everyone hated Ponyo as much as I did, and I can accept that. But ranking the movie above both Mononoke and Spirited Away, two of the best animated movies of all time?! Nah-uh, that simply does not compute. You’re wrong. Those 21% of people are just wrong. This entry was posted on Wednesday, February 24th, 2010 at 9:03 pm by Scott	.